Come to the Linssen In-Water Boat Show on Saturday 21, Sunday 22 and Monday 23 May and test sail various models from our range of new yachts. 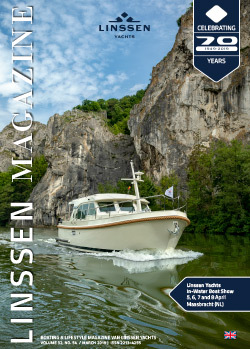 Experience Linssen yachts where they are in their element – in and on the water – and take a test sailing with the yacht of your choice under the supervision of an experienced skipper and experience for yourself its excellent cruising characteristics and low noise levels. Both the 470 Variotop® and the 590 Variotop® are world firsts that you absolutely have to see. In addition to the three world firsts, we will have a number of yachts of different lengths in the water available for test sailing and you can admire a wide selection of new and pre-owned yachts in top condition in the showroom and Collection showroom. Your dream yacht may well be among them! The aft cabin of the 410 has been completely redesigned and is even more spacious as a result, with features including a separate toilet and shower and a 2.10 m double bed. With three cabins (six sleeping berths) and the additional option of converting the saloon seating unit into a double bed with the Easy Sleep Convert System, this is the most spacious and most versatile yacht available anywhere. The 470 is the 410’s big sister and also has the new set of steps at the transom. What’s more, the very spacious saloon and large aft cabin make this yacht a mini-mega yacht. Both the 410 and the 470 have the new set of steps at the transom to provide easy, safe access to the swimming platform. The 590 AC Variotop® is the sister ship of the 590 AC Wheelhouse launched at BOOT Düsseldorf. Almost 18 metres in length, this yacht is fitted with the unique Linssen-Variotop®. When the teak doors are open, a single huge living space is created between the wheelhouse and the aft deck. The aft deck has integrated deck boxes (including faux leather cushions) and a large teak table. The wheelhouse contains the wet bar with fridge, sink with hot and cold water and the Linssen Yachts glass set. Together with the galley and dinette, the spacious split-level saloon consists of one large open space. The 590 is of course provided with all the conveniences and comfort that you would expect from a yacht of this class. The galley is particularly roomy. Every available inch of space has been used extremely efficiently. Standard features include a large fridge with freezer compartment, an induction cooker with four induction zones, stainless steel microwave/oven/grill, Corian worktop, Magic Corner cupboard, including racks and stainless steel sink. A built-in dishwasher also comes as standard. In addition to a great deal of space, the fore and aft cabins have a freestanding double bed with storage space, as well as roomy wardrobes. The aft cabin features a large panorama hatch in the transom with tinted glass. The central cabin has two single beds, which can easily be pushed together to create one large double bed. Opposite this are a separate shower and toilet, in which the standard combined washing machine and dryer has been installed. All cabins have dimmable LED lighting and luxurious wall or reading lamps next to the beds. All steps on the extra wide interior stairways have atmospheric indirect lighting. The stylish toilets and showers are very spacious and include a Grohe shower system in both the fore and aft cabins. You can also admire a wide selection of new and pre-owned yachts in top condition in the showroom and Collection showroom. Your dream yacht may well be among them!